It’s no news that the celebs’ looks are a great source of inspiration. And hairstyles are no exception, either. That’s why here we have some top perfect and cool hairstyle options of Jennifer Aniston, who has been the icon of never-fading and unblemished beauty over 10 years. Below we have some of the especially successful and memorable looks Jennifer has had during these 10 years of our knowing her as the popular movie star. Browse through Jennifer Aniston’s best hairstyles and hair colors spotted so far and get inspired for a new stylish makeover! The recent radical change of Jennifer happened when we saw her with the super cute bob hairstyle, talking about which the actress confessed that it was a way of achieving several purposes at once. Among them were the color changes, the image alterations, and the need for some stylish changes she had. So opt for this kind of changes if you are ready to take the challenge. Another popular hairstyle we were used to seeing Jennifer with are the natural dos, formed on the background of some spectacular color plays. One of them as the actress’s stylist Michael Canale suggests is made of the natural golden shade and some darker tones for the top part. For one of her looks, Jennifer also suggests putting her nicely colored hair with an ultra-effortless do, having some side swept designs and overall messy waves. This is, in fact, very easy to achieve, and what you need is just to work on your wet hair after washing it, blowing it semi-dry, styling for some wavy looks, and mussing all up for the ultimate cool effect. Another version of a perfect do is styling those perfect blonde locks into a sleek straight look, ideal for revealing the awesome shiny and healthy condition of Jennifer’s hair. This is what the actress did for making sure she can handle and get accustomed to shorter hairdos before going to extreme lengths. The medium length central parted locks are what make a perfect pair with the face framing hair. Jennifer Aniston once has confessed that her hair is naturally wavy and when opting for any hairdos like that, she doesn’t even need any curling or ironing tools. In case you’re not that lucky, you can still experiment with curling your medium length hair with a central parting, spiced up with some messy touches. Just before passing to the ultimately short bob, Jennifer also opted for an elongated version of it, styling her hair with a sleek hairdo, having the classy central parting and the naturally shiny looks. When having long hair one of the most creative things you may do is experimenting with the shades. This is what the actress did when opting for the sweet honey shade of her hair accompanied with the darker tone for the roots. 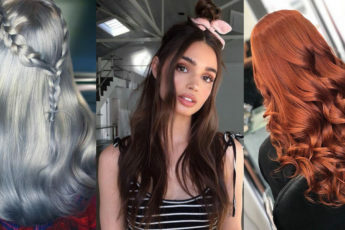 Another cool style she has opted for is the luxurious and voluminous wavy do, the best hit of which is the face framing wavy hair accompanying the central parting. Similar hairstyle encountered previously has also been put with the help of the fave honey shade of Jennifer, too. The results prove that this does work, too. Thus, here were the major and most memorable Jennifer Aniston hairstyles and hair colors you may opt for, getting inspired by the Hollywood star’s creative hairdo transformations.